With Vanessa assistance in learning the new pattern, I was able to make this olive hat. Remember this post, showing you what Vanessa made for my Aunt Kim in Ohio? We used the same tutorial and since it was my first time following a intricate pattern, I also needed personal assistance, from my friend, showing me which stitch I was supposed to go into or front post DC into. I am pretty proud of this creation and hope that we can start another one soon. Maybe after 2 or 3 more, I will be confident enough to do it by myself 😉 . If you would like to contribute to our monthly deliveries, we are collecting hats, blankets, lap covers, scarves and mittens. Please see our “Get Involved” page for further details on yarn criteria and how to mail us your contribution. My hope is that a teenage chemo warrior will like this and wear it, knowing we made it with love. 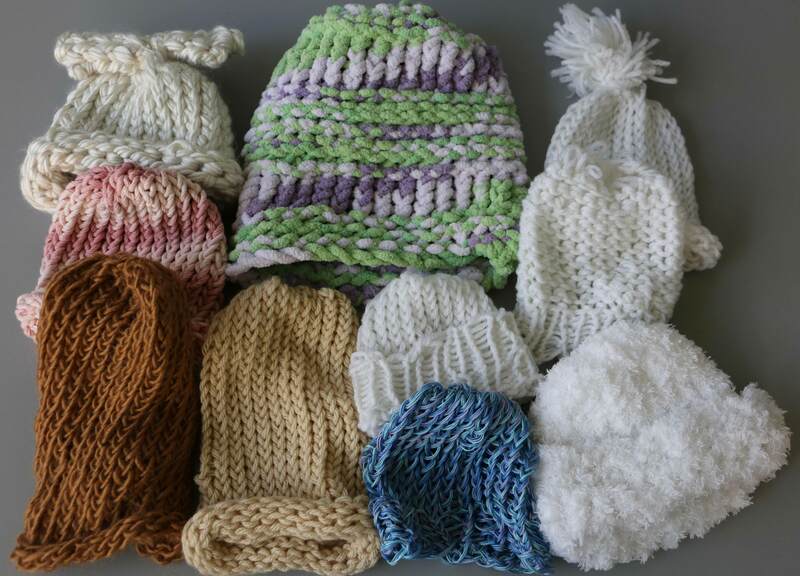 Our Ambassador of Hope, Melissa recently took these hats for children chemo warriors at CHOC. Some of these hats were given to us by friends in July, but we are now delivering them as the weather cools down slightly in California. I am positive that these will bring hope and love to our pediatric chemo warriors! Our grand total to date is now 4,219 hats delivered! We are so excited to see how far Knitting Rays of Hope has grown! We hope that we will be able to sustain this volume to keep all our local hospitals loved and warm. We thank each and every one of our team members who helped make this possible! We are blown away by how creative, generous and caring all of you are- striving to make a difference in our world! Keep spreading hope! Childhood should be all about ice cream, playing, cartoons and jumping. For many though, sadly, it’s about iv’s for chemo, losing their hair, and being sick from cancer and medications to combat it. I crocheted this hat and a pink crochet heart, with tiny cancer warriors in mind. I hope that this will bring hope and love during some pretty horrible times. We received these beautiful hats from Judy in North Hollywood. This is Judy’s second donation to us and we could not be happier to be receiving her donations. Thank you Judy for your help. These hats will surely make a few babies and children happy this month. As September has come and gone and Childhood Cancer Awareness Month is complete, we hope that people continue to talk about the need for a cure NOW and continue to raise awareness always. Children depend on the adults of the world to keep them safe and we need to live up to their expectations and find a way to end this horrible disease! We received these beautiful hats from our friend Donna in Washington State. In her letter she promised another box to follow, and we can’t wait to receive them. Thank you Donna for your continued support and for helping us to spread Rays of Hope to the little ones. Keep up the great work!